Bob Arnebeck's THE SEAT OF EMPIRE: A HISTORY OF WASHINGTON, D.C.
Washington approved a plan for the nation's capital that placed the president and Congress just over a mile a part. That seemingly inconvenient distance would allow not only buildings larger than any then extant in the nation to house the government, but it was expected that much prime real estate would fill rapidly with the seats of gentlemen and foreign embassies. And along the extensive waterfront a mile or two away there would be quays and commercial houses serving the world with American exports. Here was a capital not merely designed to form a place of union for disparate states, but to form in itself a true metropolis, a mother city, exhibiting all the fruits of American civilization. In 1791 the reason for such a pretense to grandeur was self-evident to most Americans. Their nation, then stretching from the Atlantic to the Mississippi, was destined to grow, and its capital destined to be a Seat of Empire, not merely the midpoint of thirteen rebellious colonies. Most European visitors to the capital for the next fifty years couldn't help but be amused by the emptiness surrounding the government buildings. By 1799, Washington understood that he had miscalculated, and that the city's day of "eclat" would likely come in a hundred years. Washington died on December 14, 1799, and missed the city's debut when, near the unfinished Capitol, congressmen crammed into a handful of boarding houses, two to four in a room, and largely ignored in a huge, drafty mansion a mile away, President Adams reigned, accompanied by his wife, a granddaughter, nephew and man servant. Why did Washington get it wrong? He understood that when, by law, the federal government moved to the new capital in 1800, the 140 legislators and 112 paid clerks working in the federal bureaucracy would not fill the city. But Washington saw the Potomac as the route down which most American goods would stream to world markets. So a city placed just below the falls of the Potomac would soon be the nation's principal commercial city. He did not get this impression from merely looking at a map showing the Potomac so close to the West. Growing up along Virginia tidewater, Washington was no stranger to the Potomac. For his older brother Lawrence, the river was the road to blue water and the world beyond. He served with Admiral Vernon in Bermuda, and named the home he built on the Potomac, a few miles south of the future capital, after that worthy. Only Lawrence's death ended his efforts to get George to follow a naval career. But George's one voyage, to Barbados in 1751 when he 19, did nothing to erase the alluring memory of his first surveying job three years earlier along the Shenandoah River which joins the Potomac some 60 miles northwest of Mount Vernon. In 1753, just prior to the French and Indian War, Washington delivered the Virginia governor's ultimatum to the French enemy in western Pennsylvania. Washington's war experience, leading the Virginia militia in Gen. Braddock's ill-fated campaign to root the French from Fort Duquense, now Pittsburgh, not only extended his view of the Potomac and beyond, it gave him the opportunity to get a piece of the action. Soldiers who served in the campaigns against the French, as well as soldiers in the Revolutionary War, were paid in part with warrants for deeds to land in the west. Washington also bought warrants from other veterans and became the owner of some 30,000 acres in western Virginia, western Pennsylvania and southeastern Ohio. 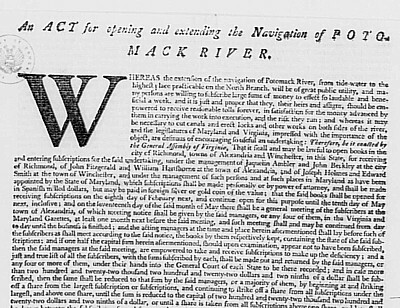 In 1784, a year after retiring as commander of the continental army, he toured the upper Potomac again. In 1785 he became president of the Potomac Company, which he organized to build the series of locks needed to ease navigation down the river. James Madison wrote at the time, "the earnestness with which he espouses the undertaking is hardly to be described." Washington wasn't alone in his enthusiasm. In the seventeenth century the Piscataway Indians prospered as they traded with whites to the south and other Indian tribes to the north. Captain Henry Fleet was taken aback when Piscataways could quote the price Canadian Indians were getting for furs. 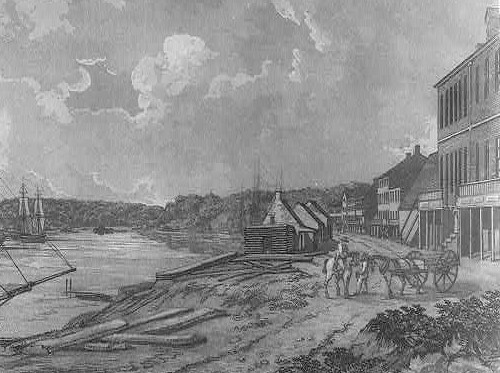 After escaping from an attempted massacre in 1676, the Piscataways left the Potomac Valley, and by 1751, three ports surrounded the future site of the capital: Alexandria in Virginia, Georgetown in Maryland, and Bladensburg, also in Maryland on what is now called the Anacostia River. The land in between seemed good for farming and in the 1770s two towns were planned not far from the future sites of the Capitol and White House: Carrollsburg, named after the powerful Maryland family organizing it, and Hamburg, founded by Germans who, when it came time to put axe to tree and clear the land, decided to settle in Hagerstown, Maryland, richer farmland up river. Then Congress almost moved to the area. In 1783 a demonstration by 400 soldiers of the unpaid Pennsylvania Line prompted Congress to leave Philadelphia and convene in Princeton, New Jersey. Not a few cities and would-be cities from the Hudson River to the Potomac began letting it be known that they too were eager to bed and board congressmen. Congress tentatively decided to split its sessions between Georgetown and Trenton, New Jersey, but, ridiculed as a congress on wheels, changed its mind, and convened in New York City in 1785 and stayed in that very convenient city through 1790.
outlined by the Constitution and prove the legitimacy of the new federal government to Americans and the world. Given that George Washington presided over the convention, the certainty of his being the nation's first president, and his love for the Potomac, someone should have predicted exactly where the capital would wind up, but no one did. The site of the capital was left up to Congress, which first met in New York City where the Confederation Congress adjourned. 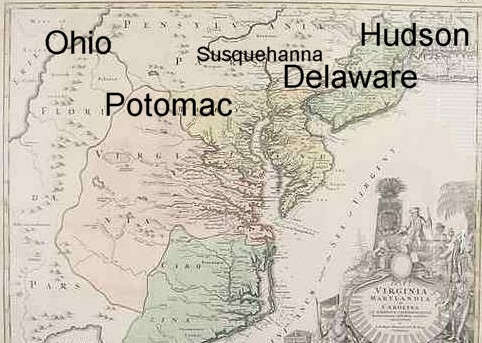 Most thought New York too far north, so promoters of the Potomac, Delaware, Susquehanna rivers, as well as Baltimore, began vying for the prize. Senator Robert Morris of Pennsylvania, thought to be the richest man in the new nation, offered $100,000 in seed money for a capital in Pennsylvania. In response, the Virginia and Maryland legislatures put up $192,000 for a Potomac site. The comforting notion took hold that the nation's capital could be built without asking Congress to appropriate a dime. The Compromise of 1790 settled the issue. At a dinner meeting between Secretary of State Thomas Jefferson and Secretary of the Treasury Alexander Hamilton, the former promised to find three southern votes to pass another stalemated piece of legislation, Hamilton's proposal that the federal government redeem at par the then almost worthless paper money the states had issued during the Revolutionary War. In return Hamilton would find northern votes for leaving New York, convening the next Congress in Philadelphia and creating a permanent seat of government on the Potomac to be ready for Congress in 1800. The temporary move to Philadelphia placated Morris and enough Pennsylvania congressmen so they would not scuttle the deal. Philadelphians banked on the Potomac capital not being built. AN ACT for establishing the temporary and permanent Seat of the Government of the United States  BE IT ENACTED BY THE SENATE AND HOUSE OF REPRESENTATIVES OF THE UNITED STATES OF AMERICA IN CONGRESS ASSEMBLES, That a district of territory not exceeding ten miles square, to be located as hereafter directed on the River Potowmac at some place between the mouths of the Eastern branch and Connogochegue, be, and the same is hereby accepted for the permanent Seat of the Government of the United States, Provided nevertheless that the operation of the laws of the State within such district shall not be affected by this acceptance, until the time fixed for the removal of the government thereto, and until Congress shall otherwise by law provide. AND BE IT FURTHER ENACTED, That the President of the United States be authorized to appoint, and by supplying vacancies happening from refusals to act, or other causes, to keep in appointment, as long as may be necessary three Commissioners, who, or any two of whom, shall under the direction of the President survey, and by proper metes and bounds define2 and limit a district of territory, under the limitations above mentioned; and the district so defined, limited and located shall be deemed the district accepted by this Act for the permanent seat of the government of the United States. AND BE IT ENACTED, That the said Commissioners. or any two of them, shall have power to purchase,3 or4 accept such quantity of land on the eastern side of the said River within the said district; as the President shall deem proper for the use of the United States; and according to such Plans, as the President shall approve, the said Commissioners, or any two of them shall prior to the first Monday in December in the year one thousand eight hundred, provide suitable buildings for the accommodation of Congress, and of the President, and for the public Offices of the government of the United States.5  AND BE IT ENACTED. That for defraying the expence of such purchases and buildings, the President of the United States be authorized and requested to accept grants of money. [51 AND BE IT ENACTED, That prior to the first Monday in December6 next,7 all offices attached to the seat of the government of the United States shall be removed to, and until the said first Monday in December in the year one thousand eight hundred,8 shall remain at the City of Philadelphia. in the State of Pennsylvania, at which place the Session of Congress next ensuing the present shall be held.9 [61 AND BE IT ENACTED, That on the said first Monday in December in the year one thousand eight hundred the seat of the government of the United States shall by virtue of this Act be transferred to the district and place aforesaid; and all Offices attached to the said seat of government shall accordingly be removed thereto by their respective holders, and shall after the said day cease to be exercised elsewhere; and that the necessary expence of such removal shall be defrayed out of the duties on imposts and tonnage; of which a sufficient sum is hereby appropriated. July 16, 1790. On July 16, 1790, the Residence Act designated the Potomac as the site of the 100 square mile federal district. However, the act left it to the president to decide exactly where on the Potomac, and where in that district to place the capital city with all the public buildings, provided that it was on the Maryland side. Washington toured the river once again, and men who owned land along the river angled for the prize. Speculators in Georgetown offered a deal difficult to refuse. All the land the government needed in the District for the capital city would be deeded to the government which would then divide it into public squares, streets and house lots. The proprietors would get 25 pounds or about $67 an acre for land the government used for public buildings and squares. Half of the house lots would be returned to the proprietor. Half would be marketed by the government. The $4 million raised from those sales, not taxes, would finance construction of the public buildings. The original proprietors of the land would be eager to cooperate because they too would profit handsomely in sales of the house lots they owned. No one thought of what might happen if the lots didn't raise enough money for the public buildings. On January 22, 1791, six months after the passage of the Residence Act, Washington placed the ten mile square District so that it included Georgetown and Alexandria, including 1200 acres of woodland that he owned near Alexandria. He made another fateful decision on the same day: as required by the law, Washington appointed three commissioners to oversee development of the city. Thomas Johnson and Daniel Carroll from Maryland, and David Stuart, a Virginian, were all slave owners. Johnson, an ex-governor of Maryland, had replaced white laborers with slaves whenever he could, whether building canal locks along the Potomac or at his ironworks in Frederick, Maryland. Washington probably toured the other sites up the Potomac just to keep Georgetown land owners on tenterhooks, prompting them to offer land at a low price. Now, to finalize a formal contract, he used the same tactic. He secretly utilized agents on the scene and put them in competition with each other. One agent tried to get the best offer he could from the landowners east of Tiber or Goose Creek, roughly where Constitution Avenue is today, and the other agents worked the other side of the creek. (In the 17th century a Catholic landowner named Pope named his 600 acres "Rome"and the creek draining it the "Tiber," a name that took about one hundred years to catch on.) When the principal land owner on the west side, David Burnes, wanted to reserve enough land for a farm, Washington had the man he picked to design the city, Pierre Charles L'Enfant, go down and troop around the eastern end of the city giving every appearance that the public buildings were to go there. (See Washington's letters to and about L'Enfant) That still didn't get Burnes to cooperate. At the end of March, Washington came to the city. Family legend has Burnes becoming more cooperative only after a personal interview with Washington during which the crusty Scot contrasted his gritty land grabbing with Washington's easy access to wealth via marriage to a rich widow. However, tucked in a cache of family papers are documents that reveal that Burnes was made amenable by a $2,500 douceur, or bribe, from one of Washington's secret agents, Benjamin Stoddert, a Georgetown land speculator. Stoddert had benefitted from both ends of the Compromise of 1790, using some of his six figure profits from the redemption of state debts to buy federal city land. At the beginning, the city seemed awash in money. Late March, when Washington came to close the deal, can be dreary along the Potomac and his plan to tour the site on horseback was thwarted by rain. The next day he summoned landowners to a meeting at Suter's Tavern in Georgetown. Encouraged by L'Enfant who knew the distances of Versailles, he announced boundaries for a Metropolis such as Washington himself, who had been to no greater city than Philadelphia, had never seen. In the middle of the 100 square mile district he wanted to build a city on 6,000 acres, about the extent of London at that time, which had a population of 300,000, with the President's house and Capitol over a mile a part. (It would be another two decades before people would begin calling the former the White House; Jefferson was already using the Roman term Capitol, as indeed, the meeting place of the Virginia legislature had been called since 1785.) Washington promised a city plan in a matter of months. Then the streets would be cut, dividing up the city into squares which in turn would be divided into house lots, and this would be done throughout the almost six mile range of the city so that all proprietors would profit handsomely. No one raised any doubts. In late August L'Enfant took his completed plan to Philadelphia. The president approved but thought it premature to designate the sites of the other buildings and many monuments that L'Enfant envisioned. Until money flowed in from lot sales, he didn't want to promise too much. He asked L'Enfant to prepare a simplified plan for engraving, then return to the Potomac and supervise building the city. In September Washington sent Jefferson and Madison to help the commissioners at their monthly meeting make some crucial decisions. 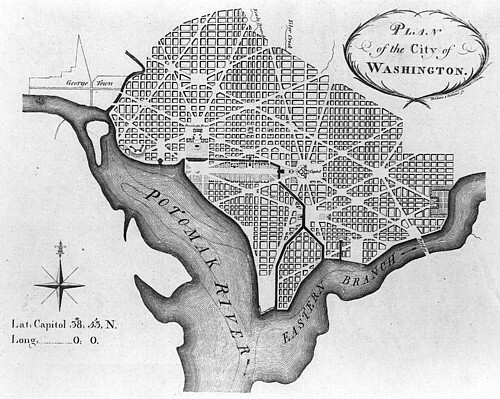 The name of the city, Washington, was made official; the District named after Columbus, recently restyled Columbia by poets and trumpeted as the "goddess" of the Republic, a fit rival for Britannia; (More on the name) the system of naming the streets was agreed upon, state names for diagonal avenues, numbers for north-south streets, and letters for those going east and west, (no "J Street," because in dictionaries and lists of the day that letter was still, in the Roman fashion, not distinguished from "I".) Ellicott was instructed to layout a handful of 60 by 120 feet house lots just northwest of the President's house square in time for an October auction. L'Enfant soon had qualms about that. Since few streets had been cleared, and axemen left a chaos of downed trees, prospective buyers could not truly appreciate his plan. He thought a million dollar loan raised by the government was the best way to finance the simultaneous development of infrastructure throughout the city and along the river shore. With streets, bridges, canals, and quays built and the foundations of the magnificent public buildings dug, perspective buyers could see the true magnificence of the plan. Meanwhile, printers in Philadelphia did not engrave the plan, perhaps, Washington feared, deliberate sabotage by people in Philadelphia who wanted the federal city to fizzle so that Philadelphia would remain the capital. Indeed, Philadelphia began construction of its own "President's house." Then at the auction L'Enfant decided not to show the only copy of the plan to those attending. The bidding continued, with L'Enfant himself buying one of the 31 lots sold, but L'Enfant's antics, as well as the lackluster sales, confused and angered Washington then in Philadelphia. The auction did establish the price of a city lot. Proprietors did quick arithmetic and determined that if all lots went for the average auction price of $80, they would be rich, though none could convince bankers of that as they tried in vain to get loans to improve their property. In dismissing L'Enfant, Washington and the commissioners used language that would resonate with future historians. They described L'Enfant as temperamental, perverse, difficult and too artistic. (His probable homosexuality may have contributed to the ferocity of his critics. Read my essay on this topic) Historians make much of L'Enfant's subsequent failures, an unbuilt mansion for Robert Morris in Philadelphia and unfinished canals for the Society for the Establishment of Useful Manufactures in Paterson, New Jersey. Little noted are the failures of the three commissioners, especially in amassing and motivating a work force. L'Enfant's approach was reasonable, and, difficult as fulfilling his grand plan by 1800 would be, he did envision using transparent public financing to create momentum that would attract free labor to build and live in the city. Instead Washington and his commissioners relied on the financial schemes of dubious speculators and to get the work done were left with the expedient of extracting slave labor from the surrounding countryside. Washington knew that L'Enfant's leaving could destroy the momentum generated thus far, especially since the commissioners stopped all work, even on the canal. He turned to Ellicott and one of the Bostonians attracted to the auction, an eloquent young stock-jobber named Samuel Blodget, to keep the project alive. Ellicott amended the L'Enfant plan slightly and had it engraved. Blodget dazzled the proprietors and commissioners with his schemes for financing development, but his effort to raise a private loan failed. The canal would have to wait until 1810 for digging to resume. Washington and Jefferson renewed their faith in auctioning lots. By firing L'Enfant, Washington also lost his architect for the public buildings. So Jefferson organized an open design competition. A plan for the president's house by an Irish builder, James Hoban, then in South Carolina, immediately pleased everyone. It replicated the grandeur of the Leinster House recently built in Dublin. He won the $500 prize and was also hired to supervise construction which began in the summer of 1792. There was one problem with Hoban's grand design. It was not big enough for the square and Washington wanted it increased in size. It took longer to find a winning design for the Capitol. Part of the problem was that the specifications that Jefferson asked for were too small for Washington's tastes. Finally he picked a design submitted by Dr. William Thornton, a West Indian born gentlemen residing in Philadelphia. Washington liked Thornton's large Classical dome, nothing better to proclaim the permanence and importance of the young republic. Thornton was not qualified to superintend construction of the building which began in the summer of 1793, and first a French and then a British architect managed that. When a vacancy arose, Washington made Thornton one of the three commissioner, a position from which he could direct the embodiment of his design, much to the consternation of the trained architects doing the actual work. Meanwhile, the commissioners economized by driving Ellicott out of the city. His replacement relied more on slaves. Ellicott summed up working for the commissioners: "Neither credit nor reputation will ever be the lot of a single person who enters into their service. I dislike the place, and every day adds to my disgust." While paying lipservice to Washington's and Jefferson's hope that skilled workers could be brought in from Germany, the commissioners set about creating a workforce of slaves hired from their owners, plus whites and free blacks who would also work for $60 a year with free room and board. At a meeting of the Commissioners at George Town on the thirteenth Day of April 1792: Present Thomas Johnson, David Stuart & Daniel Carroll Esq.The following resolve was made and a copy thereof handed to Capt. Williams. The Commissioners resolve that to hire good labouring negroes by the year, the masters cloathing them well and finding each a blanket, the Commissioners finding them provisions and paying twenty one pounds a year wages. The payment if desired to be made quarterly or half yearly. If the negroes absent themselves a week or more, such time to be deducted. With renewed optimism work continued on the president's house and both wings of the Capitol. Briefly the project became a focal point for visionary men. Along with architects and accountants, Greenleaf brought an inventor with a new brick making machine to speed the building of several houses near the river south of the Capitol on Greenleaf's Point, the soon-to-be commercial center, formerly called Turkey Buzzard Point. Greenleaf was able to pay the first year's installment to the commissioners thanks to a sale of his Capitol Hill lots to Thomas Law, a British bureaucrat who made a fortune in India. Meanwhile, Blodget created the largest lottery ever organized in America to raise money to build a grand hotel just off Pennsylvania Avenue at 8th and E Streets NW, with the hotel itself the lottery's grand prize. Then things went wrong. The just built wall of the south wing of the Capitol collapsed because of shoddy workmanship by a crew hired at a cut-rate. It was quickly decided to carry on for the moment only with the north wing, completing the smaller chamber for the Senate, and leaving the House to make do in 1800 with a large room upstairs from the Senate. Then came the slowly unfolding catastrophe that placed a cloud over development of the city for the next fifty years. With the failure of the speculators and the cloud thrown over clear title to lots in the city, the commissioners, with Washington's blessing, got a loan guarantee from Congress which prompted the state of Maryland to loan them money. They also scaled back their operations. Once the shell of the president's house was completed, they stopped work on it and concentrated on the north wing of the Capitol. This raised speculation that both buildings would not be ready in 1800 and inflamed the rivalry between land owners in the west and east ends of the city. Washington tried to mend matters by regularly visiting a step-grand daughter who married Thomas Peter, a major land owner in the west end, and then visiting a step-grand daughter who married Thomas Law. 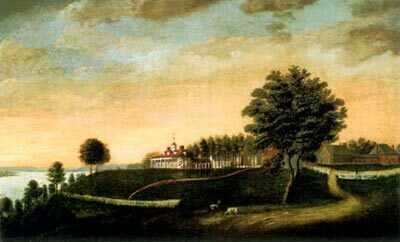 Mindful of the need to house congressmen, during his retirement at Mount Vernon, Washington put up with the aggravation of building a large house near the Capitol, which only angered Stoddert and his allies. Meanwhile, Philadelphia finished its own president's house, but yellow fever epidemics in 1793, 1797, 1798, and 1799; with the latter two forcing the complete removal of government officials from August through November, made the rural charms of the federal city attractive to many, especially President John Adams. In unguarded moments he wished the government back in New York, then that city had yellow epidemics in 1798 and 1799. 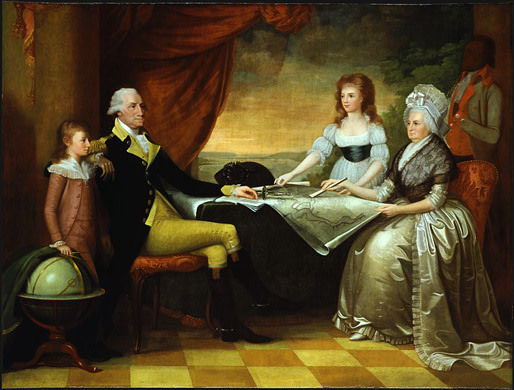 Thomas Law began advertising Washington as the place to be in August, even opening a summer theatre with British actors to attract refugees from the fever. (Read my article When Washington Was the Place to be in the Summer) Limping along now with a direct loan from Congress which was to be paid off by future sales of public lots, the commissioners finally got an appropriation from Congress to bring the president's house and Capitol to a sufficient state of completion, with paved walks flanking the dirt road between the two buildings. Though there was a sharp partisan split in Congress, New Englanders who disliked the idea of a capital on the Potomac were all in the Federalist party formed around George Washington. The opposition Republican leaders were mostly Virginians. Neither group could buck the move to the City of Washington on the Potomac without facing political consequences. A naval war with France erupted in 1798, and thanks to new war-time taxes, Congress had money to spare, for the city and especially for the new American navy. Adams's navy secretary, the Georgetown speculator Stoddert, saw to it that one of the new navy yards was built in Washington, though it was 280 sailing miles to the sea. With the belated efforts of Daniel Carroll and Thomas Law's continued building, enough houses were up around the Capitol to bed and board congressmen. Conrad and McMunn, experienced innkeepers from Alexandria, turned Law's buildings into the Republican "mess." And Pontius Stelle came down from Trenton to turn Carroll's row of houses into a "hotel" that catered to the Federalists. George Washington's Capitol Hill house was not ready for boarders. His death on December 14, 1799, spared Washington the embarrasment of welcoming the government to the unfinished city. In one of his last letters he rued "the fiery trial" the city had gone through. A building to house the Treasury offices was completed just east of the President's house, but the government had to rent private houses nearby to provide offices for the War and State Department clerks. The "temporary" houses for workers including the barracks were allowed to stand because there was no where else for the workers to move. The city proclaimed itself ready and in May the Congress voted to remove the government to the new capital. President Adams returned on November 1, 1800, and moved into the President's house. His wife Abigail joined him two weeks later. In such a spread out city with people clustered around the two public buildings, near Georgetown, or on Greenleaf's Point, and here and there a solitary house in the vast open spaces, the city was ripe for leadership from the man who lived in the city's greatest house. Plus, it seemed possible that Adams might be re-elected. He was closing on Jefferson's lead. Although far from home, for Adams there was nothing that alien about the place. It wasn't that southern. 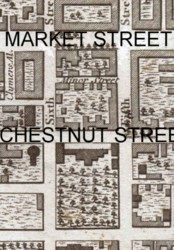 Whites outnumbered blacks 3 to1, and Adams probably had more friends in town, which is to say, living within two miles, than Jefferson, including his nephew William Cranch, a lawyer, who had come to the city in 1794 to manage Greenleaf's affairs. The Adams' family doctor in Washington, Dr. Frederick May, was Harvard educated, New England born, and had come to the city in 1796. And don't forget Blodget and Greenleaf, both from Boston and both in the city managing on-going law suits over their failed speculations. Much is made of the southern planter John Tayloe III who was building a mansion, the Octagon House, close to the President's house, but he was the only southern planter to do that. Jefferson, who came to town as Vice President, certainly didn't find his kind of people in the city. He boarded at Conrad's on Capitol Hill, squeezing around a dinner table for 14. He confessed to Abigail Adams that, as he walked back and forth to the Capitol, many men greeted him but he hadn't the foggiest idea who they were. But Adams couldn't get excited about the city, perhaps because he could not get over his envy for the man for whom the city was named. So once on the scene he only exercised his powers in improving his creature comforts. No provisions had been made for servants in his house, like a back stairs, a "necessary" with three holes or a servant's door to the oval room. And Adams did not like some of the interior decorations, so the commissioners directed workers to "take down figures at the President's house intended to represent man or beast." Abigail made a brief career dodging leaking roofs and complaining about the need for roaring fires and the scarcity of wood to feed them. Above all she fumed at the negligence of those she had to rely on to make her house habitable. They never came on time, usually hours late. 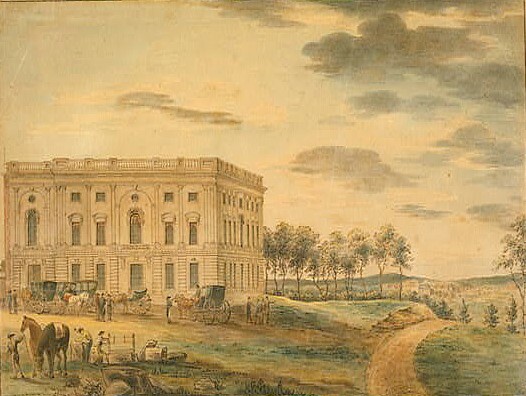 With the first family settled in their spacious but damp quarters, congressmen stowed their gear at Stelle's or Conrad's and touring their new neighborhood, found these conveniences: "one taylor, one shoemaker, one printer, a washing woman, a grocery shop, a pamphlets and stationery shop, a small dry goods shop, and an oyster house." Inside the Capitol, for most the largest building they had ever been in though it was unfinished, senators found a charming, warm chamber with seats of red morocco leather. Representative made do with a large room not unlike the one they left in Philadelphia. Both houses had a quorum by November 22, and on that snowy day, Adams rode to the Capitol to give his annual message. The gathered politicians quickly put aside their present inconveniences and resumed politics as usual. Congress had little use for Adams. The Federalists were digesting a published attack on him by Hamilton, that, in a word, argued that he was insane, especially for sacking his secretaries of war and state, and seeking a peace with France. And Adams had no friends among the opposition Republicans who blamed him for a Federalist "reign of terror" with onerous taxes and jailing government critics under the emergency sedition law inspired by the naval war with France. Adams reminded this group of warring factions that they had to come up with some way to govern the city which the Constitution put under Congress's control. But first they debated the mausoleum, a 100 foot square pyramid to hold the remains of George Washington. In 1783 the Confederation Congress had authorized an "equestrian statue" to honor the hero, and deeming that cheaper to build, Republicans tried to substitute that for the massive mausoleum. A Federalist argued that like a pyramid, "a mausoleum would last for ages." A statue "would only remain... till some invading barbarian should transport it as a trophy of his guilt to a foreign shore." However, the basic problem that made the mausoleum debate somewhat unreal was that the parks and squares of L'Enfant's plan had been completely neglected, most pocked with pits where slaves had made bricks or carpeted by blueberry bushes. On a party line vote Congress appropriated $200,000 for the mausoleum. After the bill passed Martha Washington let it be known that she wanted the bones to stay at Mount Vernon, saving the country from the ludicrous sight of a nation building a home for a corpse in a city where there was scarcely enough buildings to accommodate the living. Then accidental fires at the rented office of the War Department in November 1800 and at the Treasury building in January added to the sense that here was a city doing a disappearing act, not one arranging itself to prop up monuments. That said, in joining in the bucket brigade to fight the Treasury fire just to the east of his house, President Adams left the most indelible image of his brief reign in the city. In response to charges that the government burned the buildings to cover up thefts of government money by Federalist office holders, a congressional committee investigated and discovered the downside of using a money-saving expedient called "wooden bricks" to build a fireplace. Then before they could finally get around to creating a government for the federal district, the House had to sit in continuous session for almost a week to decide the presidential election. The Republicans mismanaged the electoral vote for president and Jefferson tied his running mate Aaron Burr. (The Constitution required each elector in the Electoral College to cast two votes for president. The man getting the second most votes would become vice president.) The House of Representatives had to pick the president with each state delegation casting one vote until one candidate won nine states. Federalists controlled six of the sixteen state delegations, and Maryland and Vermont were evenly divided between the parties. If the Federalists held firm, they could force a Constitutional crisis and have the Federalist controlled Senate choose an interim president. The Republican governors of Virginia and Pennsylvania contemplated calling up the state militias for a march on Washington, though there was no one to fight since the emergency army raised to fight the French had been disbanded in 1800. There was no unrest in a city probably more remote than the Constitutional Fathers contemplated. Not a few in Washington thought there was an inevitable solution to crisis. Maryland was one of the evenly split delegations. A Constitutional crisis would ruin the federal city investments so many prominent Maryland Federalist had made. But even with its fate hanging in the balance, the new federal city didn't count for much. Through 35 ballots, the three Maryland Federalists voted for Burr, even the worthy who represented Georgetown. The lone representative of Delaware, the Federalist James Bayard, finally gave up the fight, explaining that he could not jeopardize the future of his small state if the union dissolved over a constitutional crisis. He also thought he had assurances from Jefferson preserving the Navy and minor Federalist office holders. The election crisis over, there was only two weeks left to conduct business. On even numbered years, Congress adjourned on March 3, when representatives' two year term in office expired. By tradition Congress would not convene again until the following fall. As congressmen faced the prospect of leaving the city, there was no government for the District nor the City of Washington. A House committee had investigated city affairs and discovered the commissioners nearly bankrupt and the District riven into warring factions. People in Georgetown and Alexandria, two cities of about 3,000 and 5,000 people respectively, wanted no part bearing any burden to support road building in the City of Washington. Meanwhile a newspaper published essays advocating a government for the District with a governor, a senate of 8 and an assembly of 20 until the population topped 30,000. Then there would be 16 senators and 40 assemblymen. Plus the Constitution should be amended so the city could be represented in Congress. The Federalist controlled 6th Congress left most of that for the Republican controlled 7th Congress which would convene in the fall of 1801. But they decided they had to establish some legal system. In the Constitutional Convention George Mason had worried that the federal district would form a haven for lawbreakers from other states. Prior to Congress moving, state law still applied, but with Congress now in session, the District was in a legal limbo. So Congress divided the District into two counties divided by the Potomac, one with the current laws of Virginia and the other with those of Maryland. Thanks to this un-Solomon-like decision, the District's laws soon became an outdated hodgepodge. Those respective states soon modernized their codes, and Congress only updated what passed for law in the District on a piecemeal basis. That done, Congress had to provide a judiciary to enforce the laws, and along with three judges and marshals, saddled the District with 27 justices of the peace, which, legend has it, kept President Adams up until midnight making appointments of Federalist faithful, including his nephew Cranch as one of the judges. Then, since he was not specifically invited, Adams left the city in the daily 4 am public coach on the morning of Jefferson's inauguration. He and the other Federalist followers of George Washington had fulfilled the Residence Act of 1790, barely, and saddled the federal capital with legacies representing the worst of both sections of the divided nation: northern speculators destroyed any confidence in land values and the use of slave labor, housed in barracks, turned away free men and made the city desireable primarily to those prepared to profit by toadying up to congressmen prone to complain about the city's inconveniences. The western commerce, expected to enrich the city as it pulsed through the Metropolis to the world beyond, was nowhere in sight. Emboldened by the two big public buildings, true believers in Washington's dream expected changes for the better. Curiously, the new president, Thomas Jefferson, who had aided and abetted Washington in all his dreaming and scheming, now thought that the meagre result was just what the nation needed.